“This is a game everybody knows. It’s very clear that the Americans know that their weapons will in the end be in the hands of terrorists,” Todenhofer said speaking to RT. This is neither a mistake nor a case of negligence, Todenhofer believes, despite some opinions suggesting that American weapons could have accidentally fallen into the hands of terrorists. He recalled that in 2012 the Pentagon released DIA documents which revealed that Washington is seeking to destroy relations between Shia governments in Iran, Iraq, Lebanon and Syria. “In a certain way he [the Jabhat al-Nusra commander] is repeating what Pentagon said four years ago,” he stated. “They are trying to get rid of Assad with the help of the rebels,” the journalist concluded. Todenhofer conducted an interview with a Jabhat al-Nusra terrorist group commander for the Koelner Stadt-Anzeiger newspaper on September 17. In 2014 Todenhofer visited Syria and Iraq, and became the first western journalist who was allowed in IS-controlled territories and managed to safely return home. In the interview the Jabhat al-Nusra unit commander Abu Al Ezz said that US weapons are being delivered to the terrorist group by governments that Washington supports and American instructors have been providing instruction on how to use them. “Yes, the US supports the opposition [in Syria], but not directly. They support the countries that support us. But we are not yet satisfied with this support,” he said. He also echoed claims made by Moscow and the Syrian government that the militants were using the Syrian ceasefire, agreed on by Russia and US on September 9, to prepare for a new offensive. “We do not recognize the ceasefire. We will regroup our groups. 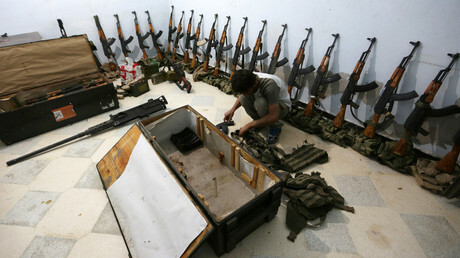 We will carry out the next overwhelming attack against the regime in a few days,” he said.